Arborvitae seed (Baiziren)-Biota orientalis (L.) Endl. Common Name: Biota seed, Arborvitae seed. Part Used & Method for Pharmaceutical Preparations: The fruit is gathered in autumn. After being shelled and dried in the shade, the seeds are broken into pieces. Meridians: Heart, kidney and large intestine. Functions: 1. To nourish the blood and tranquilize the mind; 2. To moisten the intestines and move feces. 1. Deficient blood of the heart manifested as irritability, insomnia, palpitations and anxiety: Arborvitae seed (Baiziren) is used with Wild jujube seed (Suanzaoren) and Schisandra fruit (Wuweizi). 2. Night sweating due to yin deficiency: Arborvitae seed (Baiziren) is used with Ginseng (Renshen), Oyster shell (Muli) and Schisandra fruit (Wuweizi). 3. 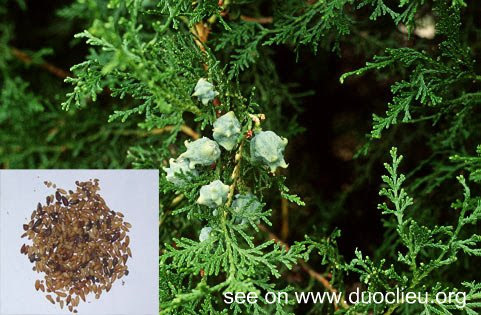 Constipation due to dryness in the intestines: Arborvitae seed (Baiziren) is used with Apricot seed (Xingren), Bush-cherry seed (Yuliren) and Peach seed (Taoren) in the formula Wuren Wan. Cautions & Contraindications: This herb is contraindicated in cases with loose stool or excessive phlegm.